At the beginning of this compelling novel, a private plane crashes 16 minutes after takeoff from Martha’s Vineyard; only 2 (of 11) people survive. The rest of the story alternates between the investigation of the crash and the stories of those on board leading up to the crash (we get a chapter from the perspective of each person on board). Fargo showrunner Noah Hawley writes a compulsively readable novel, revealing bits of information until you unravel what happened and why. 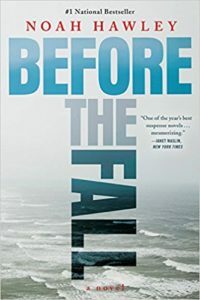 Before the Fall is an excellent choice for a book group, inspiring discussions about truth, technology, the media, and flawed characters.